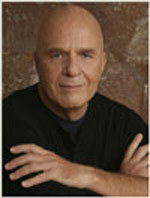 Wayne Dyer is an American author and speaker in self-help and spirituality. he served in the US Navy, got his D. Ed degree in counseling at Wayne State University. In his early career, he worked as both a high school guidance counselor and professor of counselor education at John's University, New York City. His first book, Your Erroneous Zones incorporated material that he had taught in his university lectures on positive thinking and motivational speaking techniques. In later books he broadened his content from self-actualization into spiritual concepts. On Wayne Dyer's website you can check out his blog, his upcoming events, a daily inspiration and his many books, CDs and DVDs. Amazon Synopsis: Dr. Dyer brings you this extraordinary true story about two ordinary people whose lives were touched by miracles–and he shows us what these miracles can teach all of us. Amazon Synopsis: In this inspirational work, best-selling author and lecturer Wayne W. Dyer shows you how to restore balance in your life by offering nine principles for realigning your thoughts so that they correspond to your highest desires. Amazon Synopsis: This collection of over 200 of Dr Dyer's most famous quotes and observations is a must for the readers of his previous work. Amazon Synopsis: In this wonderful little book, Dr. Wayne W. Dyer brings you a wealth of information that will inspire you to achieve success in all areas: personal, professional, and spiritual. By applying these positive thoughts to your daily life, you’ll find that you will not only see improvements in yourself, but you will also serve as an inspiration to those around you. Flip to any page . . . and soak up the wisdom—every day! Amazon Synopsis: Within the pages of this transformational book, Dr. Wayne W. Dyer reveals how to change the self-defeating thinking patterns that have prevented you from living at the highest levels of success, happiness, and health. Even though you may know 'what' to think, actually ' changing' those thinking habits that have been with you since childhood might be somewhat challenging. 'If I changed, it would create family dramas . . . I'm too old or too young . . . I'm far too busy and tired . . . I can't afford the things I truly want . . . It would be very difficult for me to do things differently . . .' and ' I've always been this way . . .' may all seem to be true, but they're in fact just excuses. Amazon Synopsis: The practice of meditation takes us on a fabulous journey into the gap between our thoughts, where all the advantages of a more peaceful, stress-free, healthy, and fatigue-free life are available, but which are simply side benefits. The paramount reason for daily meditation is to get into the gap between our thoughts, and make conscious contact with the creative energy of life itself. Dr. Wayne W. Dyer explains the soul-nourishing meditation technique for making conscious contact with God, which the ancient masters have told us about. Amazon Synopsis: How would an intelligent visitor from another planet react to life on Earth? Would we welcome that visitor's presence and views? Are we ready for such an open exchange? Weaving together science fiction, spirituality, and philosophy with wisdom, humor, and plain common sense, Wayne Dyer tells the story of two peaceful beings from different worlds who work together to enhance the well-being of all. The gifts that Eykis brings to the people of Earth help them see themselves in a new light, and compel them to rethink their negative actions. Her insightful offerings will move you to new emotions, new behaviors, and a new understanding of humankind's limitless possibilities. Amazon Synopsis: Dr. Wayne W. Dyer has put together this little book in order to convey the fact that intention is a field of energy that flows invisibly beyond the reach of our normal, everyday habitual patterns. It’s a force that we all have within us, and we have the power to draw it into our lives by being the energy we want to attract. Use the uplifting material within these pages to bring the power of intention into your life for many years to come, and experience the world in a new and exciting way! Amazon Synopsis: “This book offers you an opportunity to internalize and directly experience the great wisdom of the Tao Te Ching, a collection of verses authored by the Chinese prophet Lao-tzu. Amazon Synopsis: In this inspirational guide, Dyer reveals seven beliefs central to working miracles in our everyday lives. From "creating a miracle mind-set" and achieving change in the areas of personal health, prosperity, and fulfilling love relationships to believing in the magic of miracles on a global scale, Dyer shows us that miracles within our reach -- and within our own minds. Amazon Synopsis: The Shift—a companion book to the movie of the same name—illustrates how and why to make the move from ambition to meaning. Such a shift eliminates our feelings of separateness, illuminates our spiritual connectedness, and involves moving from the ego-directed morning into the afternoon of life where everything is primarily influenced by purpose. The Shift doesn’t mean that we lose our drive and ambition; it signifies that we become ambitious about something new. We make a commitment to living a life based on experiencing meaning and feeling purposeful, rather than never-ending demands and false promises that are the trademark of the ego’s agenda. Amazon Synopsis: The Sky's the limit for your success, your creativity, your physical and emotional capacity and your happiness. This book by Dr. Wayne Dyer can do for you to what you can do for yourself with the help of this book. Taken from the back cover of the book. Amazon Synopsis: An Enlightening Conversation with the Father of Motivation and Leon Nacson. Amazon Synopsis: Dr. Wayne Dyer's 10 Secrets for Success and Inner Peace reveals some basic principles for changing one's outlook on life. Among his recommendations, Dyer suggests having a mind that is open to everything and attached to nothing, treating yourself as if you already are what you'd like to be, and understanding that wisdom is avoiding all thoughts that weaken you. Dyer's words are complemented by pastel-colored watercolors. Amazon Synopsis: In this inspiring new book, bestselling author Wayne W. Dyer shows us that there is an omnipresent spiritual force right at our fingertips that contains the solution to our problems -- from ill health to financial worries to relationship difficulties. Drawing from various spiritual traditions, especially from the prayer of Saint Francis of Assisi, Dyer helps us unplug from the material world and awaken to the divine within. The first part of the book provides the essential foundation for spiritual problem solving. In these chapters, you'll read the words of Patanjali, a Yogi mystic whose teachings and practices deeply affected Dyer and informed his realization that the spiritual force is everywhere. The second half, organized around the prayer of Saint Francis of Assisi, contains specific suggestions to help readers put spiritual problem solving into practice. Saint Francis's legacy is one of love, harmony, and service -- putting our collective energies toward what we are for instead of what we are against. Each of these last seven chapters begins with a line from this prayer; Dyer then goes on to offer specific and practical suggestions for applying the teaching to everyday problems. These suggestions include affirmations, writing exercises, guided meditations, and other strategies for putting Saint Francis's words and the wisdom of this book into practice. Profound and thought provoking, yet filled with pragmatic advice, There's a Spiritual Solution to Every Problem is a book about self-awareness and tapping the healing energy within all of us. As Dyer writes, "Thinking is the source of problems. Your heart holds the answer to solving them." Publisher's Weekly: Veteran self-help author and speaker Dyer (Manifest Your Destiny, etc.) chooses a new format in which to present his familiar material. Here, he offers essays inspired by 60 quotations from poetry and literature that express "life's greatest lessons." Intended as a daily inspirational, each essay focuses on a topic such as patience, leadership, divinity, prayer, grief, humanity, nonconformity, enthusiasm and forgiveness. The quotes are mostly recognizable, from such luminaries as Emerson, Thoreau, Shelley, Shakespeare, Yeats, Kipling, Melville and Shaw. Within this collection dominated by white men are a few surprises, including words from Chief Seattle, Confucius, Langston Hughes and Dorothy Parker. Each essay contains some biographical information about the source and is followed by suggestions for practicing the principle expressed in the quote and Dyer's discussion, such as "reverence for nature" and "unity consciousness." Dyer's pieces are of uneven quality, sometimes vague and undeveloped, simplistic or lacking the clear compassion and positive view required to offer readers genuine help or encouragement. Although the quotations themselves are inspiring, overall, Dyer's ruminations add little of worth. Amazon Synopsis: This book is dedicated to your mastery of the art of realizing all your desires. The greatest gift you have been given is the gift of your imagination. Everything that now exists was once imagined. And everything that will ever exist must first be imagined. This book will help you See—with a capital S—that you are divine, and that you already possess an inner, invisible higher self that can and will guide you toward a mastery of the art of manifestation. You can attain this mastery through deliberate conscious control of your imagination! Amazon Synopsis: Live the life you've always wanted. Wayne W. Dyer takes us to new plateaus of self-awareness with You'll See It When You Believe It. He shows that you can direct the course of your own destiny by tapping the truly amazing power that lies within you. make your most impossible dreams come true. rid yourself of guilt and inner turmoil. spend every day doing the things you love to do. Amazon Synopsis: From best-selling author and spiritual teacher Wayne W. Dyer comes 'My Greatest Teacher,' which follows a man's journey to find understanding and reconciliation with his past. Despite having a loving family and a fulfilling career as a university professor, Ryan Kilgore has always held deep resentment and anger toward the father who abandoned him when he was born. When these emotions take their toll on his marriage - and his relationship with his own son - Ryan realizes he must confront these unhealed wounds in order to move forward in his life. While at an academic conference, he embarks on a search to track down his father, Big Bob. Along the way, Ryan encounters friends and acquaintances of Big Bob, while reawakening memories of his childhood. 'My Greatest Teacher' is an inspiring tale of how we can transform suffering and pain into forgiveness and love, and the lessons we can learn through the most difficult challenges we face. Amazon Synopsis: 4 and up. I AM, the newest children’s book by Dr. Wayne W. Dyer, is taken from his latest book for adults, Wishes Fulfilled. I AM teaches kids a simple but profound message: God is not far off in the distance, or even merely beside us. In other words, we are not separate from God—we are God! Amazon Synopsis: Dr Wayne W. Dyer has taken then 10 concepts from his book for adults "10 Secrets for Success & Inner Peace" and interpreted them for children, creating "Incredible You"! Wayne believes that it's never too early for children to know that they're unique and powerful beings, and they have everything they need within themselves to create happy, successful lives. With this book, parents can introduce these important ideas to their children. The ten concepts are numbered, titled and set in rhyming verse, and vibrant illustrations bring each point to life. At the end, there are questions that kids can answer to connect these ideas to their own lives, and make them realize how incredible they truly are. Amazon Synopsis: Dr. Wayne W. Dyer, the internationally best-selling author and lecturer, has written a new book in his series of inspirational books for kids. 'You're Not What You've Got' addresses the topics of money and abundance, with the understanding that children's earliest thoughts and perceptions about money are those that will last throughout their lives. The concepts presented in this beautifully illustrated book include: 'Money does not define who you are; it doesn't matter what others have, and abundance comes in many forms. ' Unlike most books on this subject, 'You' ',' 're Not What You've Got ' is 'not ' a how-to manual on spending and saving for kids, but rather a positive, spiritual approach to the meaning of money. Amazon Synopsis: 4 and up. In his fourth book for children, Dr. Wayne W. Dyer focuses on the topic of excuses and how they can do more harm than we realize. The book demonstrates how excuses go far beyond “my dog ate my homework,” and can actually become words that prevent your child from reaching his or her potential. The book follows a boy with a seemingly impossible dream who almost lets excuses (“I’m not smart enough” . . . “It’s too hard,” and so on) get in his way. Amazon Synopsis: Following in the footsteps of Dr. Wayne Dyer 's first children's book, the bestseller 'Incredible You!' this work goes even further toward expressing Wayne's positive message for children. In 'Unstoppable Me!' Dr. Dyer teaches children how to hold on to the no-limit thinking he believes they were born with, rather than just trying to "fit in." In doing so, they can learn to truly enjoy life and become unstoppable as they strive to attain their dreams. The 10 important lessons in this book include the value of taking risks, dealing with stress and anxiety, and learning to enjoy each moment. Each point includes an example showing how a child might apply the concept in his or her everyday life. Similar to 'Incredible You!' there are questions at the end of the book to help spark discussion and to further reinforce Wayne's message. Description: Dr. Wayne W. Dyer reveals how to change the self-defeating thinking patterns that have prevented you from living at the highest levels of success, happiness, and health. Even though you may know 'what' to think, actually 'changing' those thinking habits that have been with you since childhood might be somewhat challenging. 'If I changed, it would create family dramas . . . I'm too old or too young . . . I'm far too busy and tired . . . I can't afford the things I truly want . . . It would be very difficult for me to do things differently . . .' and 'I've always been this way . . .' may all seem to be true, but they're in fact just excuses. So the business of modifying habituated thinking patterns really comes down to tossing out the same tired old excuses and examining your beliefs in a new and truthful light. Make no mistake about it - you can manifest anything you want in life when you connect with the abundance in the Universe - and on this one-of-a-kind lecture CD, bestselling author and speaker Dr. Wayne W. Dyer shows you how to do just that! This bestselling program includes the powerful Japa meditation. Description: On this inspirational CD, bestselling author Dr. Wayne Dyer offers you 101 ways to make your life more fulfilling and enjoyable. You'll love listening to Dr. Dyer's transformational thoughts at home, in your office, and in your car! Dr. Dyer offers inspirational messages such as to 'Become aware that there are no accidents in our intelligent universe, and to realize that everything that shows up in your life has something to teach you'. Description: Gain inspirational tips for living life to the fullest by listening to Dr Dyer live as he explores the secrets of the power of intention. Intention, not as something you do, but as an energy you are a part of. Dr. Dyer has researched intention as a force in the universe which allows the act of creation to take place. Every single individual has a connecting link to this field of intention and Dr Dyer believes that by removing any and all resistance we can re-connect to this energy that intended us here and regain the power of our source. This means an absence of all limitation when all of our thoughts are in energetic vibrational harmony with source energy. Description: In this inspirational and highly informative live lecture presented to a group of chiropractic professionals, Dr. Wayne W. Dyer offers his penetrating wit and wisdom on how to develop your own healing powers, as well as that of others. Dr. Dyer emphasizes that the secrets to healing are not somewhere “out there,” but rather, healing is something that takes place inside each and every one of us, occurring when we “connect to our Source and bring Spirit to the disease.” He emphasizes that healers need to be able to banish doubt and see their clients as individuals who already possess the capacity to heal themselves. That is, those with health challenges need to have someone in their energy field who truly believes that healing can take place. Dr. Dyer explains how to operate at that higher level where doubt and ego consciousness don’t exist; and he also relates fascinating stories based on his own personal life; interactions with kahunas, yogis, and other powerful individuals; and the world of spirituality and alternative healing. Description: This four-CD collection is filled with Dr. Wayne Dyer’s incomparable wisdom. It guides us to new levels of self-awareness. There Is A Spiritual Solution to Every Problem: On this inspirational and highly informative CD program, Dr. Wayne W. Dyer offers his wit and wisdom, taking you on a sacred journey where the spirit triumphs, teaching you that there is a spiritual solution to every problem. Dr. Wayne Dye’s 10 Secrets to Success and Inner Peace: The ten secrets for success and inner peace presented here apply whether you’re just embarking on your path, are nearing the end of it, or are on the path in any way. Dr. Dyer urges you to read these ten secrets with an open heart. By doing so, you’ll learn to feel the peace of God that truly defines success. Improve Your Life Using the Wisdom of the Ages: On this stirring CD, you will learn from Dr. Dyer how to use and apply ancient wisdom from over 60 of the greatest thinkers and spiritual masters that our world has known, including Jesus, Michelangelo, Mother Teresa, Dr. Martin Luther King Jr., Thoreau, Gibran, Yogananda, and Descartes, to name a few. Don’t die with your music still in you, Dr. Dyer urges, if you want to achieve greatness. You are born on Earth to do your own unique life’s work.